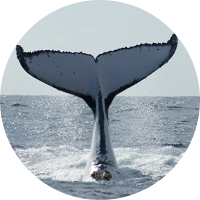 The Consortium is currently working with Wild Me on the improvement of Flukebook, an online matching platform that will enable Consortium members to store and compare their humpback whale photo-IDs online. One of the priority actions of the Consortium is to address population structure and abundance of humpback whales at regional scale. Population structure can be best investigated through a number of innovative research techniques including natural marking (photographic and genetic) and satellite tagging. These techniques provide information about connections between breeding sites, links between breeding and feeding grounds, and have proved to be powerful tools to provide abundance estimates. Large datasets—especially photo-identification datasets—have been created and updated in the last decade by different organizations in the region, but little effort has been made to match the catalogues. One of the most challenging issues of humpback whale photo-ID matching is how to match such a large volume of data, scattered across organizations, and spread over large geographic areas. The Consortium’s members have agreed that the best way to do this would be to develop and use a common matching platform in the South-western Indian Ocean (SWIO). Flukebook is a web platform that provides researchers with the advanced tools needed for scientific analysis and transboundary collaboration. Researchers have access to data management tools; photo-matching algorithms and a global catalog of individuals; and connectivity to common analytical software for mark-recapture; genetic, and socio-ecological studies. At the research level, data sharing is accomplished on a peer-approval basis which leads to growing inclusiveness. Flukebook acts as a unifying tool, filling gaps in species distribution, individual movements, social associations and genetic structure. This is why the Consortium and Wild Me are currently working together to integrate and improve upon Flukebook to meet the Consortium’s needs and enable its members to successfully collaborate online. The platform should be online and running in 2018. Flukebook is powered by the Wildbook Platform which was developed by WildMe. The improvements to the existing tool are funded for the Consortium by the Indian Ocean Commission and the French Facility for Global Environment.